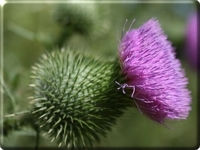 The thistle is a Celtic symbol of nobility of both character and birth, for the person who tries to harm the thistle is in return wounded by the plant's sharp spikes. It has been a national emblem of Scotland since the reign of Alexander III (1249-1286), and its image was used on silver coins issued by James III, who also adopted it as the royal plant badge, in 1470. 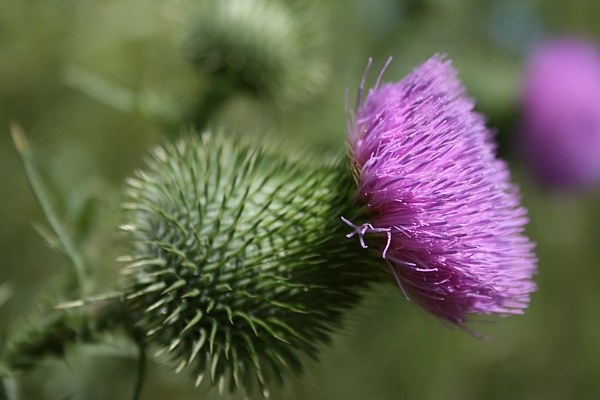 According to legend, the thistle delivered Alexander III's army from an attempted surprise attack by Norse invaders. The enemy was sneaking up on the Scots camp at night, and the soldiers removed their shoes so that they might be stealthier. But one barefoot Viking stepped on a thistle; his cry of pain alerted the Scots of the presence of the army. This legend suggests the Battle of Largs, fought in northern Ayrshire in 1263 between Haakin IV of Norway and Alexander III. The Viking defeat marked the beginning of the expulsion of Norse influence from Scotland. Scotland's highest chivalric order is named for the national flower. The Most Ancient and Most Noble Order of the Thistle was established on a statutory basis in 1687 by James VII, who claimed to be reviving an order with ancient roots. The legend of the order's origin is tied to the story of the Saltire: it is said that Eochaidh, King of Dál Raita, established the Order of the Thistle after achieving victory over the Angles under the sign of Saint Andrew's cross in the eighth century, and dedicated it to the saint. Another more credible story dates the order's foundation to 809 A.D., when Eochaidh established it to commemorate an alliance with Emperor Charlemagne. There is also a tradition holding that the order was reinstituted on the battlefield of Bannockburn by Robert the Bruce. There is some evidence to suggest that James III also founded (or reinstituted) the order in the fifteenth century. 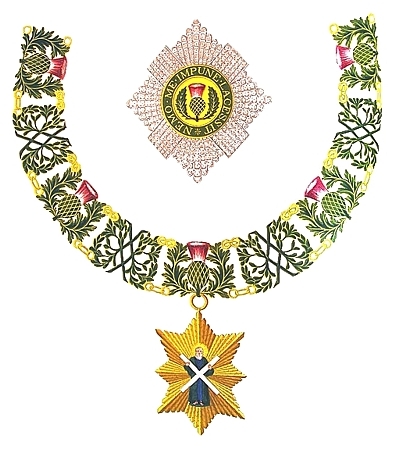 Some historians also allege that James V founded the order in 1540 because he was embarrassed that he had no honour to confer on foreign monarchs, himself having been admitted to the Order of the Golden Fleece in the Holy Roman Empire, the Order of St. Michael in France, and the Order of the Garter in England. James VII issued letters patent "reviving and restoring the Order of the Thistle to its full glory, lustre and magnificency" in May 1687. The order's motto, Nemo me impune lacessit, (or, no one provokes me with impunity,) recalls the legend of the thistle alerting the slumbering Scots army to a Norse presence. The British monarch is the order's Sovereign, and he or she grants membership without being advised by the government. Originally, the order had a maximum membership of twelve to symbolize the Twelve Apostles of Christ. That number was raised to sixteen in 1827, and Queen Elizabeth II allowed for the regular admission of women into the order in 1987. 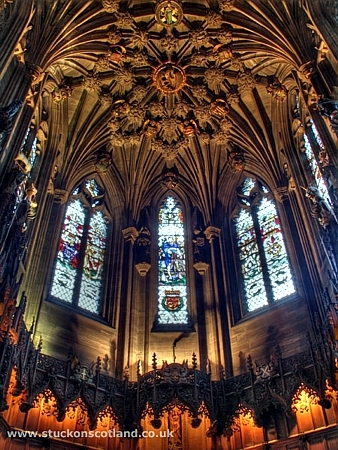 While the sixteen Knights and Ladies must be Scottish-born "extra" memberships may be granted through special statue, and do not count towards the limit or require that the recipient be Scottish. 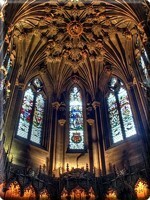 The Knights and Ladies are installed during a service on Saint Andrew's Day held in Thistle Chapel in St. Giles High Kirk in Edinburgh.